If I didn’t know better, a tile-placing, treasure hunting, site excavating game with good art would sound like a really good time. I mean, when you put those words together in the same sentence, you have visions of Alan Quartermain and Indiana Jones, so how awesome should it be? Here’s the rub, though: when you put all those descriptive words into the same sentence, then add the phrases, “worker placement” and “area control”, it has the exact same effect as pounding a rock-hard erection with a five pound sledge hammer. It totally, completely ruins it. To add insult to injury, there’s not a single, solitary die in the box. In short, Rio Grande Games, who I love for “El Grande” and “Race for the Galaxy”, has made a game with really neat art and an incredibly interesting theme and has caused me to feel as though I completely wasted seven hours of my life. To say the least, I am more than a bit disappointed. Maybe it’s that I played a few scenarios of “Mutant Chronicles: Siege of the Citadel” just before playing Tikal last night, but after a two-hour stint of hunting treasures and placing workers I was left with a bitter memory of the experience of Tikal. The concept of Tikal is that there are up to four competing teams of treasure hunters exploring the land of Tikal, which happens to be a treasure hunter’s dream. Temples and treasure sites abound, and both can be exploited for your own personal gain. The trick to profiting from your treasure hunting is to make sure that you have the largest expedition force on a temple tile when a volcano erupts, which signifies the beginning of a scoring round. 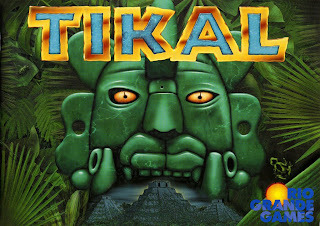 Tikal is simply a typical German-style game, which I like to refer to as EuroTripe, and unlike El Grande which has some similar mechanics, this game is simply less fun than getting a scrotum shave with a belt sander. 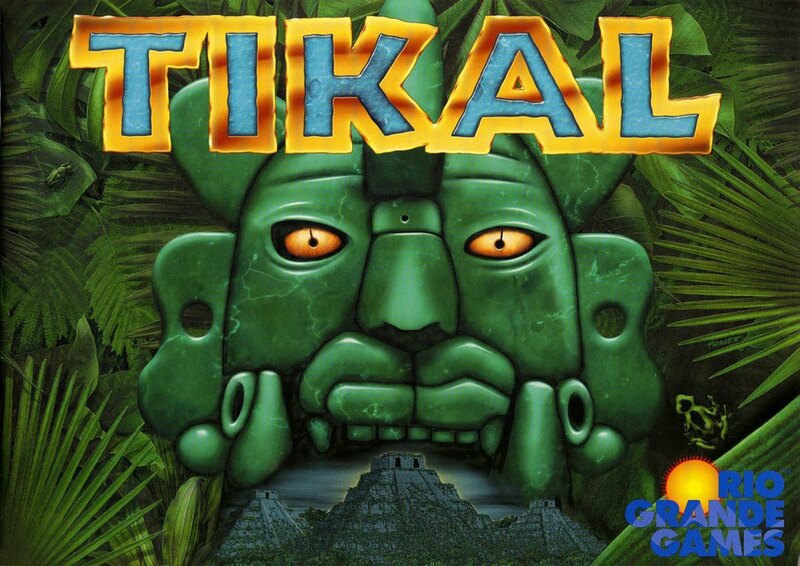 Yes, it’s an interesting game that might have academics drooling, but in my opinion, a game is supposed to be fun and Tikal simply misses the mark. Let’s open up this really pretty-looking box and see what you get for your forty bones! The first thing you’re met with are three sets of large chit-sheets which contain a tremendous number of double-sided “Settlers Of Catan” style hexagons, temple chits, treasure chits, and four of the most hideous and unintelligible player reference cards I have ever seen. All of the art is quite nice, especially for a Euro. 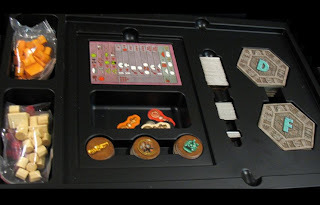 Moving on, there is a large, quite nicely illustrated game board, four sets of wooden bits that represent the workers, camps, and leaders of each player’s expedition, and finally, a rulebook. The rulebook, while very long, is written in a bunch of different languages, so the rules are actually quite short and incredibly well written. It will only take one read of the rules to “get” how to explore Tikal, which was a blessing because the game, at first glance, is a hair on the intimidating side. Setting the game is a snap, really, which is always a good thing. Simply stack the Temple chits by number, sort the hexagons by the letter on the reverse side and make a stack, make a face-down stack of the treasure chits, place your score markers on the first space on the scoring track that resides on the periphery of the board, and you’re ready to play. As per most EuroTripe, an arbitrary person goes first; this time it’s the oldest player. You really have to give it to the Germans; they seem to truly respect their elders. Gameplay is quite simple, really, which also helps keep the game interesting. The idea is that every player has ten action points to spend during their turn, and these points can be spent in a number of ways to further your expedition. The options boil down to placing a new worker, moving a worker from one tile to another, making a temple more valuable by excavation, collecting a treasure token, exchanging a treasure token with another player, establishing a camp, or finally, placing a guard at a temple which locks out all other players from scoring at that temple. It’s really not rocket science, but since much of the game is about hosing over your opponents, it makes for a lot of difficult and important decisions. Unfortunately, none of the decisions are particularly fun, and the game suffers greatly from the problem of Analysis Paralysis and tremendous amounts of downtime. Each player’s turn can last as much as three or four minutes or as short as one minute, but in a four player game it literally can be a fifteen minute wait between turns if all the players take their sweet time. This is an inexcusable crime, in my opinion, and the main reason I was not more into this game. Let’s explore what the players actually do in Tikal. To start a turn, simply take the top hexagon from the stack and place it. Each tile has a number of small, rectangular stones on the edges which indicate how many action points are required to move into the square, and a new tile must be placed so that at least one existing tile leads to the newly placed tile. There are several types of tiles with varying uses for each, so there is a bit of variability in the decisions of where to place them. First, there’s the standard jungle tile which serves no purpose other than being a potential site to build a camp. Next, there’s a treasure tile that has a variable number of little golden idols on each. When placed, the player must stack the treasure chits on the tile according to the number of idols indicated. Third, there are the temple tiles which are the main scoring mechanism in the game. Each temple has a starting value illustrated on it which equates to the amount of points one can score during a scoring round, and these can be upgraded to higher values during gameplay. Finally, there are the volcano tiles which act as the catalyst to begin a scoring round and also act as terrain blockers as they are impassable to all workers. Additionally, the volcano tiles are not placed at the beginning of the round as other tiles are, but instead are played at the end of the round to signify the end of the scoring round. Scoring rounds are exactly like every other round, but the players score their own position at the end of using their ten action points without placing a terrain tile. Once all players have taken their actions and scored their positions, gameplay resumes as normal with the next player in line playing a terrain tile and continuing the game. Once a player has placed a tile, they may take the ten actions I described above. By using one action point, you may place a new worker from your reserve to the board, and these can only be placed on the base camp that is illustrated on the board or onto a camp that you’ve erected during gameplay. Once you have workers on the board, you may then move an existing worker from one place to another. The action point cost for this is determined by the amount of stones that exist in between where you are currently and the adjacent tile you’d like to move to. Alternatively, if you have a camp, you can move from camp to camp or for a single action point. I should also mention that there each player has one larger worker bit that represents the leader of their expedition. It sounds like a cool job, but the leader is exactly like the workers aside from the fact that it counts as three workers when determining a majority position on a tile. It’s not much, but it’s something! Now that you understand movement, let me get into some other actions. First, if you have more workers on a temple tile than any other player, you may excavate it for two action points which raises the scoring level of the temple by one. Next for three action points, you can take a treasure chit from a treasure tile. I should explain that these treasures come in eight sets of three, and you score more for having two or three of a kind. To aid you in getting multiple like treasures, for three action points you can exchange treasures with any other player. The idea is to give a player one that doesn’t help them make a match while getting matches of your own. The one caveat is that you cannot break up a pair or triplet, so if an opponent has two of a kind of chit, you cannot ever steal either of those chits. Next, for five action points you may establish a new camp, which is essentially a subway station and spawn point for your workers. These may only be placed on an empty jungle tile or a treasure tile that has all of its riches pilfered, and there may only be one camp per tile, so it can also be used to deny an opponent a camp site. Each player may only establish two camps per game, and these may never be moved. Finally, for five action points you may place a guard on a temple, provided you have a majority position on that tile. This locks you into this tile, meaning that no player aside from you will ever score that temple. You may only guard two temples, ever, and these guards are permanent. Finally, there is an auction-based tile buying variant included that allows players to see which tiles are available and sell their scoring points to buy them and determine their turn order, but it’s not that exciting. The short version is that each player starts with a score of 20 points and can bid the points in order to take a certain tile of their choosing from the available face up tiles, and in the process, determine the order of play. That, in a nutshell, is Tikal. Place workers, move workers, and try to get a majority position in all of the really juicy spots. There are a limited number of workers, so it’s imperative that you effectively place them and move them to gain the most points during a scoring round, of which there are three in addition to the end of game scoring round. All in all, it really sounded neat and I dropped the forty bones to buy it, but I can’t see myself playing this game very often. My wife gave this game a score of negative 25 on a scale of one to five, and the other players there gave it between a two and three out of five. It’s interesting, and the theme sounds really slick, but the player downtime between rounds is so abhorrent that Tikal really amounts to three minutes of fun spaced out by twelve minutes of waiting and yawning. If you’re a fan of tile-laying worker placement games that lean heavily toward area control, this may be a good game for you, but the way I see it, this game is just not that much fun. On our third game we decided to create a house rule that involves some murder in the jungles, and that really added some fun to the game. Our variant is that for three action points you may choose an opponent that has workers on a tile that you have workers on, and you may then roll as many dice as you have workers there. Your opponent does the same. Compare the dice, and for every die that scores a five or six you may remove, meaning assassinate, that opponent’s worker, who goes back into the player’s reserve. The exceptions are that you may not attack a leader, although they still get a die to roll, and you may not attack anyone when a base camp is present as it may attract the unwanted attentions of the Tikal Police Department, resulting in trial and subsequent incarceration. This new mechanic adds some more “screw you” factor as well as a bit of Ameritrash to the game and makes for an infinitely more enjoyable experience. 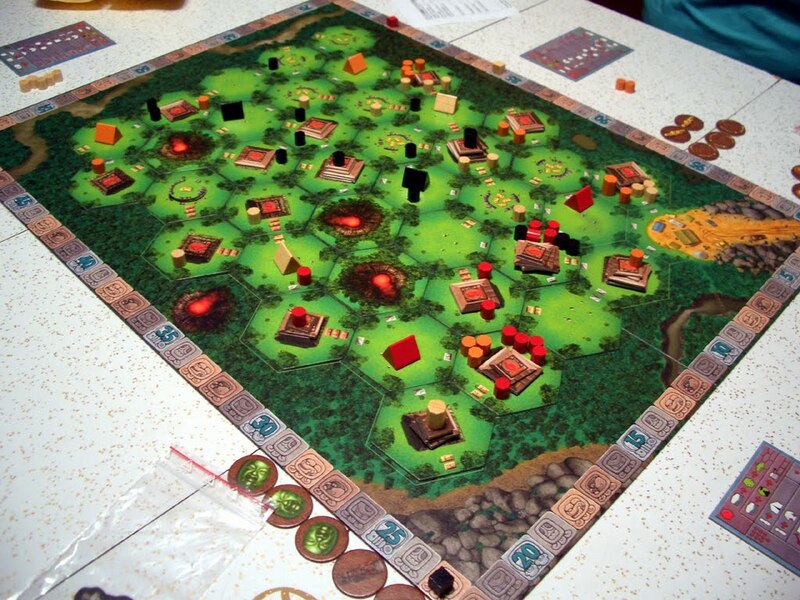 – Nice art really makes Tikal a thematic winner, with all the bits being of great quality. – Did I mention that the game is incredibly dull? I cannot envision a game that is less exciting. It’s interesting and has a cool theme, but the lack of direct player interaction, the incredibly long downtime between turns, and the predisposition for Analysis Paralysis this game engenders simply kills the fun factor with a Jack Kevorkian degree of skill and precision. If you read this and buy this game, it’s because you really like Euros, and I’m glad I helped you out. If you read this and don’t buy it because you don’t like this style of game, I’m glad I saved you forty bucks; spend it on El Grande instead as it is a far superior, yet similar, game. Previous PostDefenders of the Realm – Cure The Pandemic That’s Causing A Castle Panic In The Magic Realm!Next PostThrough The Desert – Who’d Have Thought Herding Cute Little Pastel Camels Would Be So Cutthroat? Our group likes this game! We have a chronic analysis paralysis sufferer and it does really show in this one though; we’ve considered adding a round timer of some sort to keep it brisk. We’re cool with the worker placement/area control aspects and my wife is chronically unwilling to read text when she’s having fun so the iconographic cheat sheet has worked well with her. I’d rate it a 4/5 for table. I’ll definitely check out El Grande though! Brother, El Grande is probably one of the top 5 games I’ve ever played. I’m OK with Euros, as my reviews indicate, but Tikal suffers from the predisposition toward player AP, but not only that, due to the large amount of actions allowed and the fact the board changes 4 times before you get to take your actions it’s very hard to pre-plan effectively, at least in my opinion. Glad you love it, though! There’s room enough for all types of game and all types of gamer! I only just found your site via BGG and your Gencon posting in the past week or so. I just wanted to say that I’m a fan of your reviews both in content and style. You’ve pointed out some games to me I hadn’t known about that are on my list now. Thanks for the good work!